Sustainable McDonald’s fish: Pollock trawlers harm Native Alaskan halibut fishers. A supposedly sustainable fishery is harming Native Alaskans. Trawl boats trying to catch pollock, which is the main component of the Marine Stewardship Council–approved Filet-O-Fish, also tend to scoop up halibut. 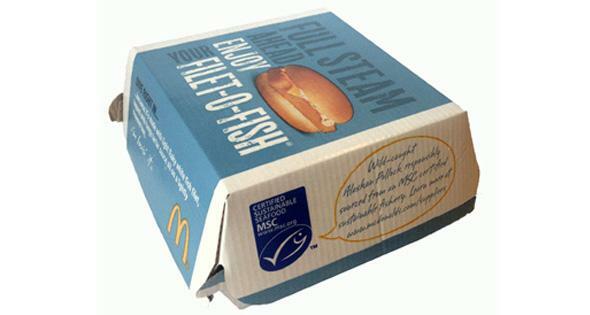 When you buy a McDonald’s Filet-O-Fish sandwich, you might notice the little blue label that tells you the fish you’re about to eat is certified as environmentally sustainable. That sounds like good news for the environment, for fish, and for customers. But what the label doesn’t tell you is that Native American communities in Western Alaska are endangered, in part because of the Seattle-based trawl boats that bring you products like McDonald’s famous fish sandwich. The little blue label is bestowed by the Marine Stewardship Council. Its mission is to promote sustainable fishing practices by certifying fishing industries and their products. The council does that by reviewing catch methods, collateral environmental damage, and more before bestowing its ecolabel. The problem: Trawl boats that are trying to catch pollock, which is the main component of the MSC-approved Filet-O-Fish, also tend to scoop up halibut. Meanwhile, the smaller boats that actually catch halibut and bring it to market are going out of business. Over the past few years, falling catch rates for halibut in the Bering Sea have begun to threaten remote native communities—Yup’ik and Aleut, predominantly—that depend on the fish for both their economies and their food. Trawl boats and hook-and-line fishers on smaller boats have been locked in this food fight on the Bering Sea for years, and there are gray areas to their debate. For example, management of halibut fishers has been faulty at times, and the science surrounding this particular fish population is shaky—much about halibut is simply unknown. But at heart, this is a story about whether native people living closest to a resource have the right to depend on it. Trawlers—which are sometimes the size of football fields—that catch pollock and flatfish such as sole and flounder also catch and kill a lot of halibut. Their operators will tell you it’s less than 1 percent of their total haul. That’s true. But because the trawlers haul billions of pounds of their own catch every year, last year that resulted in 6.2 million pounds of accidentally caught halibut, according to a federal report. To their credit, the boats that bring home pollock—the main ingredient for the Filet-O-Fish; fake crab for sushi; and a lot of the breaded, freezer-aisle fare—have done a lot to reduce their role in the carnage. Still, that role remains large. The pollock industry is allowed to catch 551,000 pounds of halibut a year, but in recent years it has exceeded that cap without consequence, hitting 873,030 pounds in 2009, and 815,710 pounds in 2012. Boats fishing for sole and flounder, also sustainably certified by MSC, take an even bigger chunk of the halibut population, catching 4.6 million pounds in 2013. These boats’ flatfish are processed overseas and come back to the United States as, among other fare, grocer-branded filets in the freezer aisles of stores such as Walmart. Because trawl boats can’t legally catch halibut, all of the bycatch (as it’s known in industry-speak) gets thrown overboard. Some of those fish may live, but a lot of them die. Over the past six years, bycatch of halibut has added up to 54 million pounds. That’s almost twice the amount of halibut caught intentionally and brought to market by the same region’s hook-and-line fishers (that are also certified sustainable, by the way). To put the amount in context, that’s enough fish to give four halibut servings to every person in California. The halibut population has dropped so dramatically on the Bering Sea that in October the U.S.-Canada commission that protects halibut—called the International Pacific Halibut Commission—said it would end halibut fishing in Western Alaska if the United States could not find a way to rein in the trawl boats. That might sound reasonable, if you’re only interested in protecting the fish. But if halibut fishing ends completely in Western Alaska, small-scale fishermen aren’t going to get jobs at Walmart. In places like St. Paul and Savoonga, remote native villages on islands, there aren’t many options: a few government jobs, jobs with the tribes or schools, one or two private employers, and fishing. That’s it. And more than 30,000 people living in Western Alaska have deep cultural ties to halibut or depend on it for food. In Alaska and Canada, 8,787 people fish halibut for a living, and thousands more fish halibut in Washington, Oregon, and California, where the imperiled fish migrate. Subsistence halibut is separately regulated. The fish can be caught for people to live on—but they won’t be able to sell it. And often subsistence fishers can’t catch halibut without some sales to supplement the cost of going fishing. To get to St. Paul, Alaska, an Aleut village where residents were once enslaved by the fur seal industry, one takes a plane with a life raft in it over the Bering Sea. Savoonga, which has been inhabited for 2,000 years, is so remote that sea ice forms around it from November to May, locking it away from the ocean. A very low-income community anywhere else in the United States would stand a better chance of surviving such a blow to its primary industry. These are expensive places to live. Gas costs up to $6 a gallon, propane for cooking more than $14. If no one can fish for halibut, many people will leave, and even a small amount of out-migration will threaten institutions, especially schools, where funding is tied to attendance. The dominos fall from there. Families. Culture. Language. Simeon Swetzof Jr., mayor of St. Paul, tried to articulate this in early June at a meeting in Sitka, Alaska, of the North Pacific Fishery Management Council, the quasi-governmental group that regulates American fisheries. These meetings are conducted with a refreshing amount of decorum, so when Swetzof lost his cool during his testimony, the room turned uncharacteristically charged. His family fishes, he said. His daughters are baiters. His wife makes meals for fishing crews. If halibut fishing ends, he said, “The younger folk will have to migrate and seek opportunities elsewhere.” Then he volunteered to stop talking because he could not stop crying, and his co-workers had asked him not to fall apart in front of the federal appointees. Just minutes later, Matt Upton, an attorney for Seattle trawl company United States Seafoods, shifted the discussion to job loss in the Washington-based trawl industry. Another member of the council’s advisory committee had proffered that the trawl industry could better weather cuts than family-run halibut boats, particularly in remote areas but also in other parts of Alaska. Upton shot back, “That pissed me off,” then described the O’Hara Corp., one of six Washington-based companies that dominate the flatfish industry, as a family business. It is. It also owns interest in processing operations in China, 12 scallop boats, two herring boats, and three flatfish trawlers. In 2011, the National Oceanic and Atmospheric Administration found flatfish trawlers earned an average of $11.7 million per boat. His comments gave the first signal that the council and its committees would be sticking with the status quo. After nine days, the council went ahead and resolved the problem. The news releases said as much. Newspapers went ahead and reported it. The council cut the trawlers’ bycatch, they said. But do the math and you will see that the “fix” actually exacerbated the problem. It’s a 21 percent rollback on paper. That’s just half the 41 percent rollback that the International Pacific Halibut Commission says it needs to see before it will give its blessing to continued halibut fishing on the Bering Sea. Unless something changes soon, these and other native communities will have to pack up their fishing gear. There are 15 people on the North Pacific Fishery Management Council, only 11 of whom vote. Of those, seven are appointed by the U.S. Secretary of Commerce, with five representing Alaska and the other two Washington. The rest hail from various posts in government, most with expertise in fisheries. All have some degree of conflict of interest: To have expertise in fishing, you have to have experience. Two Alaska council members were recused from the vote for purported conflicts of interest. They were expected to tip the scales toward reining in trawl, and without them, the council approved a plan that won’t solve the urgent problem, a plan that puts the Alaska halibut fishers at risk of being shut down entirely. Several sat in the audience weeping during the vote. This article was written in partnership with InvestigateWest, a nonprofit newsroom covering government accountability and other topics. For more information, visit the InvestigateWest website.